Branded by the Spanish Inquisition as an "evil dreamer," a "notorious mother of prophets," the teenager Lucrecia de León had hundreds of bleak but richly imaginative dreams of Spain's future that became the stuff of political controversy and scandal. Based upon surviving transcripts of her dreams and on the voluminous records of her trial before the Inquisition, Lucrecia's Dreams traces the complex personal and political ramifications of Lucrecia's prophetic career. This hitherto unexamined episode in Spanish history sheds new light on the history of women as well as on the history of dream interpretation. Charlatan or clairvoyant, sinner or saint, Lucrecia was transformed by her dreams into a cause celébre, the rebellious counterpart to that other extraordinary woman of Golden Age Spain, St. Theresa of Jesus. Her supporters viewed her as a divinely inspired seer who exposed the personal and political shortcomings of Philip II of Spain. 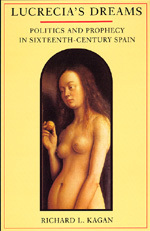 In examining the relation of dreams and prophecy to politics, Richard Kagan pays particular attention to the activities of the streetcorner prophets and female seers who formed the political underworld of sixteenth-century Spain. Richard L. Kagan is Professor of History at Johns Hopkins University. He is the author of Students and Society in Early Modern Spain (1974) and Lawsuits and Litigants in Castile, 1500-1700 (1981) and the editor of Spanish Cities of the Golden Age: The Views of Anton van den Wyngaerde (California, 1989).